A few weeks ago we spent a good 2 weeks down at the Jersey Shore and had a wonderful time exploring the island. If you have never visited, we personally think Wildwood is the go-to Jersey Shore destination. There are hundreds of different things you can see and do while visiting...some are free, others are low-cost and others will cost you a lot more! While visiting we had a chance to check out East Coast Helicopter which offers rides and miniature tours of the Wildwood island and southern tip of Stone Harbor in New Jersey. You will find them on the last pier of Morey's Piers, at the rear. Sometimes there are long lines and if you hit it just right...you wait won't be long at all. 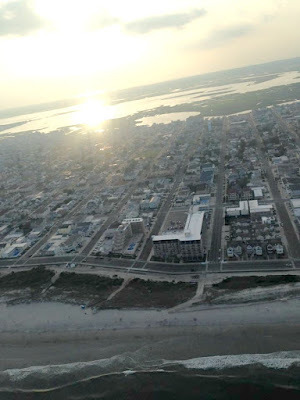 Wildwood is a 5 mile long island comprising of the Village of Anglesea, North Wildwood, Wildwood, Wildwood Crest and Diamond Beach. It's a beautiful island that attracts millions of visitors during the popular tourist season which runs May through the end of September. With that said, events and many attractions run year-round. When we visited the helicopter ride cost $50.00 per person. We have heard that at other times of the year/season it can cost a little bit more. The helicopter can ONLY hold 3 passengers + the pilot. You do get a little discount if 2-3 passengers are joining you for the ride. The ride will last 7-9 minutes, maybe 2-3 minutes longer depending on the wind & weather. It ONLY flies weather permitting. 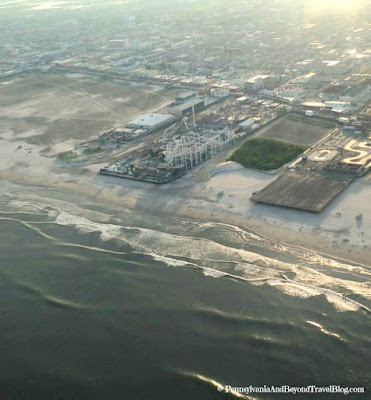 I am including three nice aerial shots that we obtained during our helicopter ride along the Atlantic Ocean side of the Wildwood island. 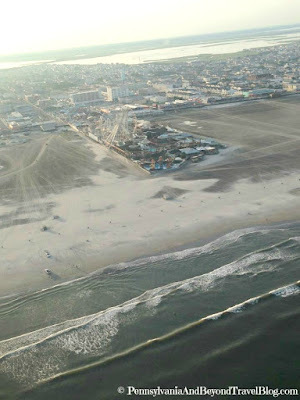 If you can afford it, we highly recommend you give this a try when visiting Wildwood in New Jersey.